Two of the key backroom staff at Super League rugby league club St. Helens R.F.C. have graduated with a Master’s from the University of Chester. Head Physiotherapist Nathan Mill, from Rochdale, and Head of Strength and Conditioning, Matt Daniels, from Rainhill, Merseyside, worked full time at the club while completing their MRes (Master’s by Research) qualifications. Both of them were supported in their sports exercise research by Professor Craig Twist, Dr Jamie Highton and Dr Edd Thomson, who all work in the Department of Sports and Exercise Sciences. Matt’s research topic was looking at training load and adaptations in strength, power and high intensity intermittent running of elite rugby league players across a pre-season training phase. The club’s Head Physiotherapist Nathan Mill started his career in professional sport at St. Helens R.F.C. as an academy physiotherapist from 2003 to 2008. He then moved on to work full time in Premiership Rugby Union before becoming the Head Physiotherapist at Huddersfield Giants. He returned to St Helens in 2013 (where he was part of the club’s incredible 2014 campaign). During his time working in rugby league, Nathan has held the position of Head Physiotherapist at England Rugby League from 2011 to 2015, where he was responsible for the physiotherapy care of players in the Elite Squad including the World Cup in 2013, Four-Nations in Australia in 2014 and the successful series win versus New Zealand in 2015. 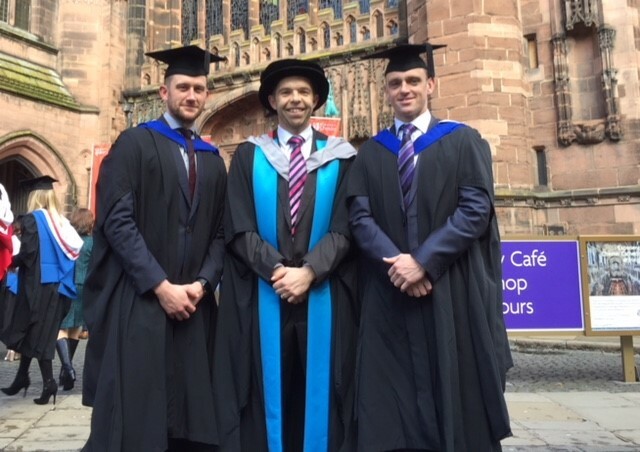 Nathan explains why he chose to study for an MRes at the University of Chester: “Like Matt, I also had a strong affiliation with the Sports Sciences Department through previous collaborations, and it also has an excellent reputation in the subject area. The University has enabled me to achieve a formal level of qualification that I have aspired to achieve for a number of years but never had the opportunity. The MRes allowed flexibility for my studies and my career commitments, and the support of the staff throughout has been an important aspect for me personally.